In recent years, much of the conversation concerning drug enforcement has emphasized national policy. From new funding to fight the flow of opioids to sentencing reform measures for some narcotic offenders, Washington has been the nexus of debate about drugs and criminal justice. But on a more local scale, in major and midsize cities across the country, how have police responded to the presence of drugs in their own communities? At the level of neighborhoods and specific streets, what can arrest records tell us about the war on drugs in its current form? We set out to study data pertaining to drug arrests in six major cities in various regions of the country: Baltimore, Boston, Chicago, Dallas, Denver, and Hartford. These locations were chosen because of their participation in Open Data programs that provide comprehensive and publicly accessible crime data. Analyzing arrest records in 2018, we’ve tracked which offenses are the most common and the precise locations in which they take place. These results reveal particular neighborhoods in which the drug trade is prevalent and the substances producing devastating impacts within each city. Whether you live in one of these places or wish to understand how drug enforcement occurs in America’s urban communities, you won’t want to miss what we uncovered. Narcotic Crimes: On the Rise or Decline? In terms of drug arrests per capita, the cities studied underwent profoundly different shifts between 2017 and 2018. 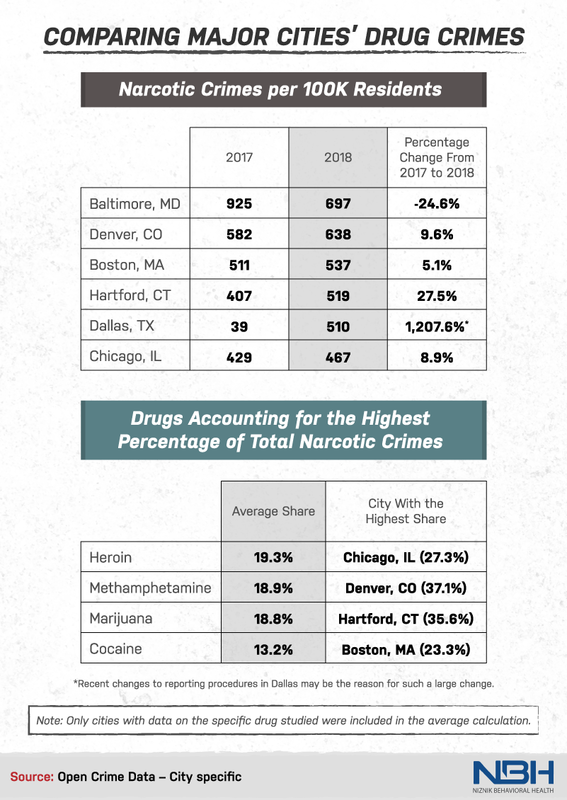 In Hartford, Connecticut, a surge of 28 percent transpired over this period – although this uptick may result from an increase in police department personnel, rather than intensified narcotics activity. Conversely, Baltimore saw a nearly 25 percent decline. The largest statistical shift occurred in Dallas, where drug-related arrests rose a stunning 1,207 percent. This change likely stems from recent changes to the city’s reporting procedures, however, rather than an unprecedented wave of drug-related arrests. In addition to possessing contrasting arrest trajectories, the cities included in this study faced somewhat different drug scourges. In Chicago, heroin was involved in more than a quarter of all arrests; in recent years, local police and federal authorities have collaborated to stem the flow of heroin and other opioids within the city. Denver had the largest percentage of arrests related to methamphetamine compared only to the other cities profiled, whereas Boston authorities seemed especially focused on cocaine offenses. Below, we’ll present each city’s data in more detail, analyzing the distribution of drug arrests for various substances over time and in specific neighborhoods. Don't let fear cost you your life. While marijuana was the substance most often involved in drug arrests in Chicago, arrests related to pot have actually declined in recent years. Similarly, while possession remained the most frequent offense in the Windy City, arrests of this kind have trended sharply downward since 2015. In that year, the police department entered a sweeping agreement with the American Civil Liberties Union to curb stop-and-frisk tactics, a move that would logically reduce arrests for marijuana and possession charges overall. During that same period, arrests for the solicitation of narcotics climbed, signaling a shift toward targeting individuals actively seeking drugs. In some of Chicago’s most economically depressed areas, however, drugs arrests were intensely concentrated. Garfield Park, a part of the epicenter of Chicago’s struggle with opioids, witnessed almost 29 percent of the city’s heroin-related arrests, in addition to 13 percent of its marijuana charges. Lawndale, another West Side neighborhood, witnessed a disproportionate number of crimes related to cocaine (including offenses involving crack). In a city increasingly defined by inequalities in wealth and income, it seems the distribution of drug arrests may reflect the contrasting experiences of rich and poor residents. Boston authorities log drug arrests with somewhat less detail: In most of the arrest records studied, the drug in question was not specifically identified. But among those where a particular substance was noted, arrests for cocaine surpassed those for heroin – an interesting finding within a state where opioids remain a critical threat. Additionally, the uncategorized drug arrest figure may fall substantially in the coming months, as Boston police adapt to the legalization of recreational marijuana in Massachusetts. Certain Boston neighborhoods were hot spots for drug arrests: The South End area saw 18 percent of crimes involving cocaine and roughly the same portion of all arrests involving heroin. The neighborhood is characterized by ongoing gentrification, meaning these arrests likely occur just blocks away from brownstone homes worth millions of dollars. The South End also includes Boston’s so-called “Methadone Mile,” a strip of Massachusetts Avenue where treatment providers are clustered and drug overdoses regularly take place. After Colorado legalized marijuana in 2013, Denver saw its marijuana-related arrests spike temporarily, then decline substantially (you can still run afoul of the law for offenses such as smoking in public or if you’re under age 21). Cultivation arrests, however, rose steadily and significantly between 2013 and 2018, a testament to the array of black market growing operations that have cropped up alongside the legal industry. Arrests for cocaine and heroin also rose slightly during that period, as did arrests related to drug possession overall. But the most concerning trend in our Denver data related to yet another substance entirely: methamphetamine. Arrests related to the drug increased each year between 2013 and 2018, and its resurgence has complicated public health efforts in a city where opioid use is already problematic. The city’s Capitol Hill neighborhood is at the center of this development, with residents finding drug paraphernalia in public places and an increase in homelessness. The neighborhood is a hotbed for enforcement activity as well, accounting for 19 percent of cocaine arrests, 10 percent of meth arrests, and nearly 18 percent of arrests involving heroin. In Dallas, drug arrests have developed along a seemingly irregular trajectory. Arrests for manufacturing and possession rose between 2014 and 2016, fell the following year, and then inclined steeply again in 2018. Meanwhile, other drug arrests decreased each year from 2014 to 2017, before rebounding in 2018. It’s quite possible that these 2018 increases reflect the joint activities of federal and local authorities: A combined task force has recently targeted crime in specific areas, yielding dozens of arrests in Northeast Dallas. Relative to the other cities studied, however, Dallas’ drug arrests were relatively evenly distributed across neighborhoods. This trend included popular tourist areas: A significant share of possession arrests occurred Downtown, specifically around Dealey Plaza, best known as the site of the assassination of John F. Kennedy. In an equally surprising finding, 7 percent of drug manufacturing arrests also occurred in Dallas’ Downtown, a ritzy and primarily commercial area. Baltimore’s troubles with drugs have long been widely known: The city’s narcotics trade was memorialized in “The Wire,” which has earned a cult following since its 2008 debut. Yet, the city’s public data portal is more limited than that of other municipalities, confining our analysis to some extent. We can, however, observe a striking decline in drug arrests between 2017 and 2018, with a notable drop in records for cocaine, heroin, and marijuana offenses. This shift may strike some as encouraging. Many have called for the city to revise its focus on drug interdiction to prioritize preventing violence. Yet, others view reductions in arrests as part of a reckless trend toward ignoring crime altogether. Some experts say that police officers have withdrawn from proactive tactics after riots erupted following the death of Freddie Gray and that this development is responsible for a recent rise in violent crime. Compared to many of Connecticut’s other cities, Hartford has struggled with high crime rates. But between 2005 and 2018, drug arrests modestly declined in Hartford, with the exception of one substance: fentanyl. Arrests involving this synthetic opioid were first recorded in 2017 and increased substantially the following year. In one incident that made national headlines, two Hartford police officers were hospitalized after being exposed to the powerful substance during a raid. The city’s Frog Hollow neighborhood was a hotbed for drug arrests, witnessing 44 percent of Hartford’s arrests related to heroin and 30 percent of its arrests involving cocaine. The area has also been ravaged by gun violence, which many say is intertwined with the Frog Hollow drug trade. Marijuana arrests, however, were concentrated in the North End neighborhood, a once-vibrant neighborhood now dominated by empty lots and abandoned properties. Our findings demonstrate substantial differences in drug enforcement efforts in each city, with some police departments adopting more active measures while others de-emphasize minor narcotic crimes. Moreover, cities differ in their particular drug challenges: While Denver struggles to fight the scourge of meth, marijuana and heroin are seized most often in Chicago. No single solution can be prescribed for all settings, and police departments should adopt approaches tailored to the residents they serve.But we hope these differing tactics provide a basis for future comparison, so authorities can adopt successful tactics for use in their own cities. Moreover, law enforcement agencies cannot address the impact of drugs on American communities alone. Substance use is a complex phenomenon, and appropriate solutions must be just as multifaceted. One major requirement of comprehensive policy is high-quality treatment, allowing substance users to break the cycle of chemical dependency. At Niznik Behavioral Health, we’re committed to providing individualized and excellent care, with a network of facilities designed to meet a diverse array of needs. If you or someone you love is struggling with substance use, reach out to us today to learn how we can help. The cities of Chicago, Boston, Denver, Dallas, Baltimore, and Hartford all participate in Open Data programs. These programs are publicly accessible government databases that provide up-to-date figures on key issues like building permits, food inspections, and crimes. For our study, we looked exclusively at the crime data. This data set reflects reported incidents of crime that occurred in each city. After compiling the data, we filtered our findings to examine crimes related to narcotics only. We grouped the data based on the description of each crime. Any crime that mentioned a specific drug was combined in a group that was labeled after that drug. Similarly, any record that mentioned a specific crime type, like possession or manufacturing, was combined in a group that was labeled after that crime. Our maps were created using the reported longitude and latitude of each crime. The per-capita income map for each city was generated using Tableau’s in-program map layers. Using the heat maps we created, we counted the total number of narcotic crimes in a specific area and compared that to the total number of crimes to find out what parts of each city had the most crime. Whether you live in one of the cities studied, we hope you’ll share this project with your friends and family who might find it compelling. Accordingly, we encourage you to use our findings and images, provided that you do so for noncommercial purposes. We also request that you link back to this page so that interested readers can explore the entirety of our data. For more information, simply fill out the form.